(i) Synergy Green Industries Limited (SGIL), was incorporated in the year 2010 is engaged in the business of foundry i.e. Manufacturing of Castings, Industrial Castings, Turbine Castings, Metal Castings, Steel Castings and Windmill Parts. The Company Started as a green filed foundry project in 2011 and entered in commercial operation in June 2012. So we can say that the growth of the company depends upon the performance of the above two industries. Let us see how these industries have performed over the years and what are the challenges faced by the industries. During 2017-18 Indian wind installations dipped by 2/3rd to 1762 MW. This drop was mainly on account of transformation from the feed-in tariff system to reverse bidding method. New reverse bidding era brought down the unit KWH power tariff by 50% to below Rs 2.50. Excepting USA & China, the majority of countries have implemented reverse bidding system for renewable power. That is why we have seen how Wind Energy companies such as Inox Wind and Suzlon have not performed well. In fact, Inox Wind is one of the clients of Synergy Green Industries. However, management is confident that introduction of the reverse bidding process, the government’s priority towards renewable to protect environment & reduce foreign currency outflow through oil imports, and supported by GST reform, Indian wind industry is projected to attain 10 GW of annual installation within the short period of two years. Apart from Wind Turbine Industry, company is also producing castings to Mining, Pumps & Plastic Injection parts. Looking at India’s growth story, these industries are also offering huge growth opportunities for large castings. During FY 2017-18, non-wind segment contributed 24% of revenue and expected to reach 33% during the next two years. (a) Each MW of wind turbine requires 15 MT of castings and global wind casting demand is around 7,50,000 MT. 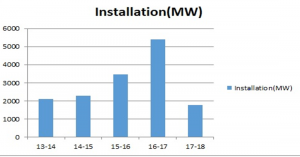 Indian wind casting demand is likely to reach 1,50,000 with 10 GW of annual installations. With the global export of wind turbine assemblies from India, total casting demand is likely to exceed 2,00,000 MT. (b)The company established as a leading wind turbine casting manufacturer in the country with supplies to all leading wind turbine manufacturers in the world. Considering India and global demand, there is a great opportunity for the company to capture 10% of the global market share and offers >30% CAGR for the next 5 years period. The Company has maintained a long-standing relationship with its major customers such as like M/s Vestas, Denmark , M/s Gamesa, M/s GE Renewable and M/s Enercon Germany, M/s ZF and M/s Siemens. As per DRHP, the company has shown Kalyani forge and Ramakrishnan Forge which is trading at P/E of 17 and 20 respectively. Synergy Green Industries Ltd (World Class Plant) No.1 in Efficiency in India ..
From World Leaders Vestas Denmark, Siemens Germany, ZF Germany.. Listing today on BSE SME Exchange. The company has a negative net worth since inception in 2013 due to heavy losses occurred till 2015. Conclusion: The Company has a huge D/E on books as on FY18. The PAT in the year 2017-18 has gone down to 4.6 Cr as compared to 4.85 last year mainly due to due to a steep increase in raw material prices. The company provides casting to the companies working in the Wind and Non-Wind Energy sector. The Wind Energy sector has contributed 75% of the company revenue in 2017-18. The companies which are working in the Wind Industry sector such as Inox Wind and Suzlon have not performed well lately. The management is confident that the coming years would be good for the company but I would suggest waiting for at least 1-2 quarters to see how the company performs than we can think of investment.